The desert is strange. One knows that there is an abundance of life out there and wonders how flora and fauna survive. Because survive they certainly do, have done so and will forever. The desert is lovely. One only has to become atuned to the different scale of climate, distance and color. That might take a while, or happen rather swiftly. For me, it was love at first sight. 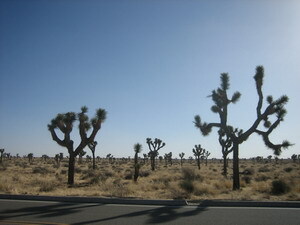 Here are some more informations about Joshua Trees and Joshua Tree National Park. What an amazing picture. I’d never seen a tree like that before. No wonder, Miko, Josuah trees are the “trademark” of the Mojave Desert and are to be found in southwestern North America only. We’re going to Big Bend National Park in May. Hopefully, I’ll have some great photos for you all. Big Bend is quite unusual. Most of it is part of the Chihuahuan Desert. It looks like desert. But there are hot springs there, and inactive volcanoes, and a very, very impressive river canyon. Also, within the park, are part of the Chisos Mountains. In the mountain basin is the lodge. To get there, one starts on the desert floor and drives up a winding mountain road, over a pass, and into the basin. I’ve actually seen clouds floating by the door of our room. In the basin, the temp may be 80, and down on the desert floor 110. The change in the vegetation as one drives up the road into the mountains is startling. The flora goes from desert plants to mountain plants and trees. There are peccaries that wander tamely about the lodge area. I say “tamely”. I sure wouldn’t try to pet one. There are also black bears, now, which have made their way back into Big Bend from Mexico. Plus, a few people have been attacked by mountain lions. I try to be alert when I’m there! Peccaries! Black Bears! That sounds like my kind of place. From a safe distance, of course. The funniest experience for me was staying in a cabin in the desert near Palm Springs last year where roadrunners lived. They actually had a welcome comittee out for us upon arrival. All day long they strolled around, had a nibble to eat (grasshoppers, lizards) and were generally very undisturbed by us. Oh, I love roadrunners. We don’t see them much around here, more west of us. But they are so wonderful and comical to watch. The peccaries seem pretty docile, although, as I say, I wouldn’t put that to the test. But the idea of black bears and mountain lions gives me the shivers. I’ll probably stick to the more well traveled areas. Previous PostPrevious Good News, Bad News. Next PostNext A Luxury Commodity?